The Endau Rompin National Park is the second largest national park in Peninsular Malaysia. Besides the main entrance, at Kg Peta, there is another entry point at Kg Selai for the southern regions of the park. 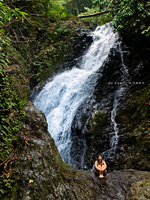 In this relatively unknown part of Endau Rompin, there is a powerful waterfall, the Taka Tinggi. To reach Kg Selai, take the Yong Peng exit of the North-South Expressway, direction Labis and follow the signs for Bekok. Continue to the recreational park of Sungai Bantang, where you can organise transport to the park and guides. You can drive yourself to the base camp at Lubuk Tapah, but inside the park the tracks are bad and a 4WD is needed. After registration at the Ranger Station you will pass a few Orang Asli villages. The tracks can become very bad in the rainy season. When you reach the Selai river, you will be suprised by the nice and well maintained Base camp. There is also a campsite with a number of basic chalets, kitchen facilities, but you must bring your own food. From the Base Camp it is a 1-2 hour trek along the Selai river to reach the roaring fall. The track is well maintained and clean, difficult spots are provided with rope bridges. The fall can be heard before you see it, as it is around a corner. It is a big powerful fall, and the pool is not really inviting for a swim. To get a better view point, you have to cross the river. It is good that ropes have been provided for, otherwise it would be a risky adventure. At the top of the fall there are more rapids. If you have time to explore, there are more waterfalls in the region. One of them, Takah Pandan, you can reach easily on your way back to the camp. This dreamlike fall invites you for a rewarding swim. 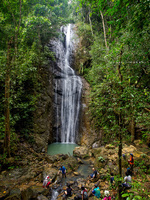 Takah Selow Fall and Takah Pandan Fall are the most popular waterfalls at Endau Rompin, Selai. Although they are easy access, you still need about 30 mins of jungle trekking to reach them. A guide is compulsory for all waterfalls in the park. Takah Selow Fall is a series of small waterfalls. It has 3 tiers of cascades. The Takah Pandan Waterfall. It has a more than 50 m high vertical fall. The journey to Takah Berangin is the toughest trail in the park and packed with lots of leeches, compared with other waterfalls here. Before the body has warmed up, you have to start climbing up a steep slope. The whole journey is a lot of ups and downs. Ropes are fixed at some difficult parts . The least visited waterfall in the park is Takah Tempaang. In the same river (Sungai Tempaang) as Takah Berangin Fall. To access the waterfall, you need river trekking in the last part of the hike. It has a deep pool great for diving. Just back from the water fall, couldn't find the rope bridge and climbed cross the rocks to get a better view. Guide is mandatory but he does too follow the yellow ribbons in the trees. Trail is good accessible, Many leeches. And cameras in the trees to track wild life or illegal entrance with out permit But over all well worth the hike. Took us abt 1 1/2 to reach and 1 hr back from the camp site. Water is very nice. Some silting due to illegal logging at base camp. Sebarau tame. Leeches many... also got lintah. Had one under my arm the size of a nut sac. You have to try fishing at midnight by moonlight. Please use guide. Forget the leeches. Scrape them off later.